Save the insects caught in the web of a bouncing spider! Turn the wheel and try to catch the number of small animals indicated with a pair of pliers. 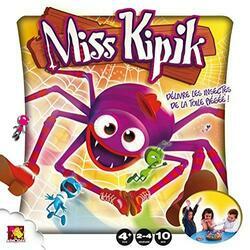 But beware if Miss Kipik surprises you! Discover an "address" version for toddlers and a "memory" version for older ones. Contents of the box : 1 tray with rotating spider, 1 pliers, about 20 insects, 1 wheel.